The Togan Grande Pendant light by Tech Lighting features a unique design that echoes a large-scale hand-spun pottery ring. The symmetrical design and spun metal shade make this piece a true work of art that is sure to stand out in any space. Its spun metal shade is offered in fully and partially painted variations and includes a white cloth cord to complete the contemporary look. Scaling at 13” in length and 20” in width the Togan Grande is ideal for dining room lighting, hallway lighting and kitchen island task lighting. 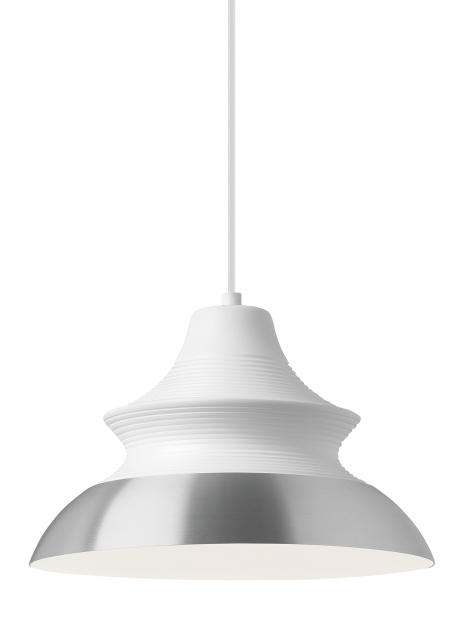 Also available from Tech Lighting is the smaller scale Togan Pendant, to find the Togan Pendant simply search for Togan Grande to find its nearest relatives. This fixture does ship no-lamp providing you the option to light this fixture with your preferred lamping. Rated for (1) 75 watt E26 medium base lamp (Not included). LED includes (1) E26 medium base 9.5 watt 800 delivered lumen 90 CRI 2700K LED A19 lamp. Dimmable with most LED compatible ELV and TRIAC dimmers. Includes 6 feet of field-cuttable cloth cord.